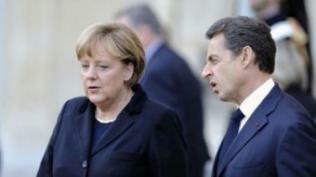 REUTERS - France and Germany are to sound out conservative European leaders on Thursday about their plan to defuse the euro zone’s debt crisis, eager to rally support before a high-stakes EU summit. European Central Bank President Mario Draghi signalled last week that an overhaul of the euro zone’s fiscal rules would be the condition for the central bank playing a greater role in calming the debt crisis. As EU leaders prepare for their summit, the ECB will meet in Frankfurt on Thursday for a monetary policy meeting at which economists widely expect it to cut interest rates by 25 basis points to a record low of 1.0 percent.